In recent years, many of the health benefits of chocolate have come to light, and chocolate has earned a reputation as being supportive of a healthy diet. This is wonderful news for chocolate lovers around the world! 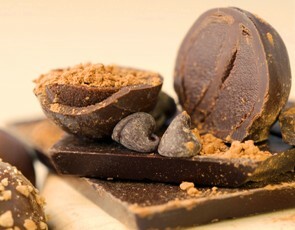 Not only is chocolate the world’s favorite sweet indulgence, it is now also known to be filled with nutrients. Chocolate contains over 300 chemical constituents, including minor stimulants such as caffeine and theobromine that can trigger a mood altering effect. It also contains phenylethylamine, which is the chemical that the brain produces when we feel happy or in love. The carbohydrates in chocolate can increase neurotransmitter activity in the brain and increase serotonin levels – which may explain why people feel so good when they eat chocolate. Even the fragrance of chocolate has an effect on us. When we smell chocolate, theta waves increase in the brain, making us feel relaxed. The health benefits of chocolate are also due to the fact that it contains a significant amount of flavonoids, as well as containing Vitamin B1, and magnesium. Flavonoids are also found in fruits, veggies, tea, and red wine and are beneficial for the heart. They also act as antioxidants. Dark chocolate contains about twice the amount of antioxidants as milk chocolate, with less calories! In Latin America, chocolate is still highly esteemed and is used as a natural remedy for various ailments in traditional healing. Don’t Feed Chocolate to Your Pets! Chocolate may have many health benefits for humans, but for animals, it can act as a poison. The stimulant known as theobromine which is found in chocolate cannot be metabolized or excreted by cats and dogs. In fact, feeding chocolate to your pet in any form (such as chocolate bars, cookies, ice-cream, cake, frozen yogurt, etc.) can cause serious medical problems such as seizures, cardiac irregularity, internal bleeding, and could even result in death. Never leave your dog or cat alone with chocolate. Keep it away and keep them safe! Next: Find out about the fascinating history of chocolate.